Alec & Magnus キッス. . Wallpaper and background images in the Alec & Magnus club tagged: kiss alec magnus city of bones. 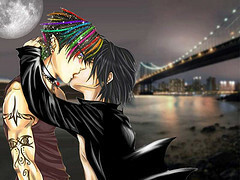 This Alec & Magnus fan art might contain ビジネス街, 繁華街, ビジネス地区, ダウンタウン, and ダウンタウンのビジネス地区.